I thought I'd get a night off blogging but Oh No, that Jon at GZG has just dropped this little surprise into my email. Aliens with a Crustacean-like appearance which led to Human troops encountering the species for the first time to nickname them "Crusties". 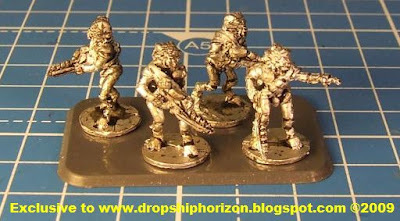 GZG 15mm Sci Fi "Crusties"
They'll be the usual 8 to a pack with two each of four poses. The figures are 18mm sole-to-eye level and 20mm overall. Jon assures me the detail on the tentacled faces, is incredible - and acknowledges it doesn't show up too well in these photos. The first pack will be "rifle" weapons, with some heavier stuff to follow if reaction proves to be good. Available soon. Possibly in time for SELWG this coming weekend, but definitely the week after. 15mm not-prawns... fantastic! Oh why oh why do manufacturers have to have more sci-fi product lines than I can realistically paint? Fantastic. These are just what I need - especially if they're coming with further weapon options too. Now all we need is a battlesuit. I am considering 40K Tau Crisis Suits with some mods as battlesuits/combat walkers for my Crusties.